Few estates in the world can claim to have maintained the highest quality standards uninterrupted for half a century and more. 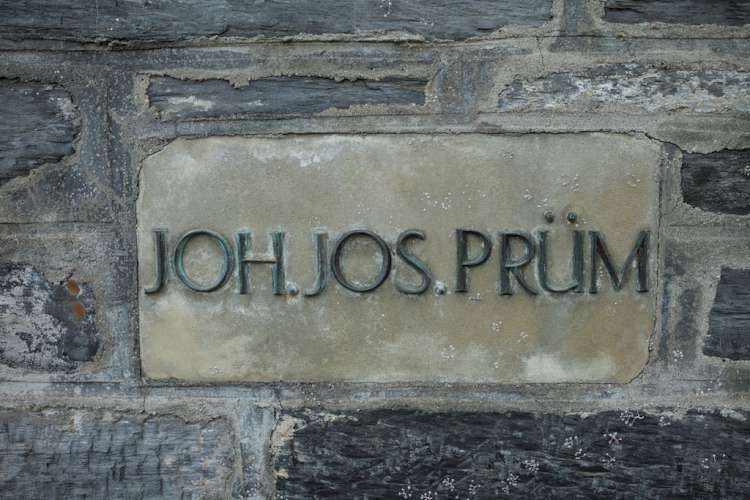 Joh Jos Prüm, the most famous of the many Mosel wine estates bearing the Prüm name, is one estate that can. 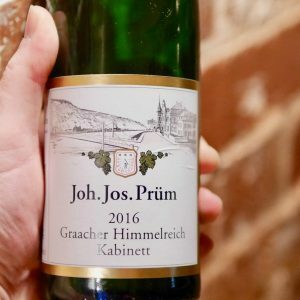 This week the importer of JJ Prüm held their annual Prüm brekky. What a way to start the day! Devouring 16 wines from Kabinett to Goldksapsel and the heart racing 2004 Bernkasteler Johannisbrünnchen Eiswein! 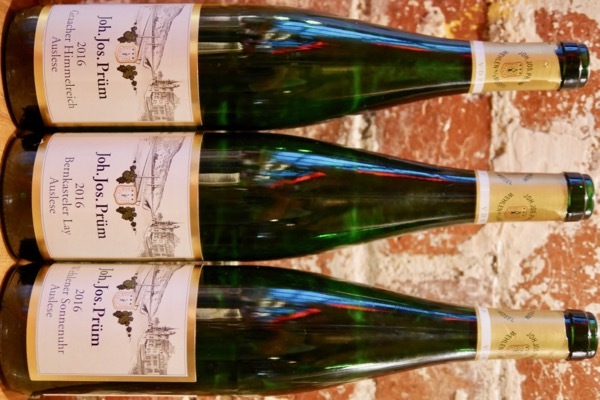 Today we offer Prüm’s 2016’s. A year where Graacher Himmelreich and of course Wehlener Sonnenuhr shined. There’s a few sneaky museum wines too! It was a pleasure sitting with James Halliday to run through the 16 Prum’s and hear his insights. The Graacher’s and Wehlener’s proved their class at all levels. 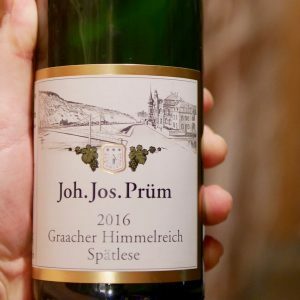 The wines have less of the Prüm stink than in the past! Something that always dissappears with a little bottle age. Take a look at the Zeltinger Spätlese. The Auslese Goldkapsels were delicious across the board. Only at the Goldkapsel level did the Bernkastler rise to the standard of the others. Overall the year presents as more approachable young with the exception of Wehlener. Vinosity was there in the Goldkapsel Wehlener but the rest of the 16’s are still in the early first phase of development as you’d expect. The 2004 Eiswein from Bernkastler Johannisbrücchen exceptional, a breathtaking wine. 2009 and 2012 Graacher Spatlese and 2012 Graacher Auslese were showing the first signs of shifting to the 2nd phase of development. They’d harmonised, some secondary characters were starting to show. The wines looked beautiful. The 2003 Wehlener Sonnenuhr had sadly fallen over. The hot 2003 year not having the legs of a more typical year. Kabinett – Wehlener then Graacher. Drink the Graacher first and hold the Wehlener for a little longer. Kabinetts are just such fun drinking! Spätlese – Wehlener, Graacher, then Zeltinger. Lovely textural element in the Graacher and Zeltinger. The Wehlener is tightly coiled and getting ready to explode! Auslese – Wehlener then Graacher. This year saw a lift in alcohol to around 8.5% from the more typical 7.5-8.0%. The balance in these is superb the nose on the Wehlener is explosive, again the palate waiting to explode. Auslese Goldkapsel – Wehlener + Graacher line ball, then, Berkastler. These special selections took everything to a new level, poise, sophistication, complexity, harmony, such delicious wines. The Bernkastler the most apparently rich and luscious at the moment, I feel it will be surpassed by the Graacher and Wehlener as they age. Museum – 2004 Bernkastler Johannisbrücchen, the 2009 and 2012 Graacher’s available here are really starting to blossom! Everyone should drink at list one of these in their lifetime. Just a few drops on your tongue and the flavours will linger for 10 minutes! 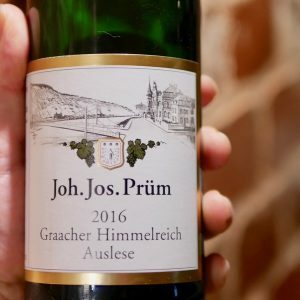 Wow, even the most dedicated wine geek often has trouble getting their head around the German naming systems, something they’ve been working on simplifying! When it comes to wines containing some level of grape sugar, the Germans have a classification that dictates ranges of sugar levels grapes for a specific wine must be picked at, in essence establishing a framework for the ripeness, amount of Bortytis and shrivel / raisoning the fruit should have when picked. The amount of grape sugar left in the wine after it has fermented, is up to the maker. All of this super detailed information is interesting to know. At the end of the day the most important thing is whether the wine meets those standard criteria for good wine. During Riesling Down Under it was great to hear winemakers from around the world, all saying they don’t care much for the numbers, they picked their fruit on flavour and made their wines to achieve balance and harmony. Riesling is one of the few grapes that is capable of producing a complete spectrum of wine styles, from bone dry to lusciously sweet. The key to maintaining top quality throughout this broad range lies in a rigorous selection process. As the harvest progresses, we make daily decisions about each vineyard parcel based on the maturity of the fruit and the prevailing weather conditions. Healthy grapes are painstakingly separated from botrytis-affected fruit, and the various selections are vinified separately. Our traditional wines, with residual sweetness, are selected from the harvest according to their ripeness and flavour development. The finest lots from our classified vineyards are bottled with their corresponding single-vineyard name and ripeness (Prädikat) level. For the non-botrytis wines, there are two Prädikat levels, Kabinett and Spätlese. Beyond the lightly sweet Kabinett and Spätlese bottlings, made without botrytis, there are three Prädikat levels of botrytis-selection wines that get progressively sweeter: Auslese, Beerenauslese [berry selection] and Trockenbeerenauslese [dried berry selection]. In addition, when vintage conditions allow it, we produce Eiswein from grapes that have frozen on the vine. The picture from Dr Loosen above is a great illustration of the different conditions of grapes at harvest and the styles they are destined to make. You can see the level of Botrytis and shrivel / raisining increasing as we move through the styles from Kabinett to Trockenbeerenauslese. The Botrytis or Noble Rot, imparts wonderful flavours and textures to the wine, and is to be revered like the blue moulds of Rocquefort and the washed rind cheeses of Munster in Alsace, appropriately both cheeses marry beautifully with a glass of Riesling. Note how the buckets are colour coded according to the end destination of the fruit and how little of the Trockenbeerenauslese is produced. The skill of pickers and willingness to pass through the vineyard several times to ensure all grapes are picked at the optimal time is the key to success. The freshest style is Kabinett and as you move up the scale you’ll see additional complexity added by botrytis and other winemaking influences in addition to greater levels of sweetness. Each style whether Kabinett or Eiswein being perfect for consumption on different occasions with different foods. The Beerenauslese, Trockenbeerenauslese, and, Eiswein being exceptional dessert wines. Kabinett and Spätlese being suited to table wine consumption. The standard line for the German’s being that where the English offer tea to guests in the afternoon the German’s offer Kabinett or Spätlese wines, more akin to a table wine. That said I devoured a Wagner-Stemple Kabinett, with pasta and cheese on a 38°C day in Melbourne, perfection! Auslese sitting on either side depending on the style the estate makes. This intense sorting process is beautifully articulated by Ernie Loosen from 2min 25sec in the vineyard below. Prüm is an estate that prides itself in making beautifully balanced wines, no matter what the sugar level, that age incredibly well. In 1993 I was hoovering bottles of Prüm, Spatlese and Auslese from 1983. All were still fresh and vibrant, yet, they had settled beautifully, showing great poise. These wines are from climates that often deliver bracing natural acidity. For the wine techies, pH is ofter 2.9-3.0, lower than, but, not far off Champagne, and, loads higher than Coke at a pH of 2.4. Again all the detail is irrelevant, the balance, poise and harmony in the glass being what really matters. 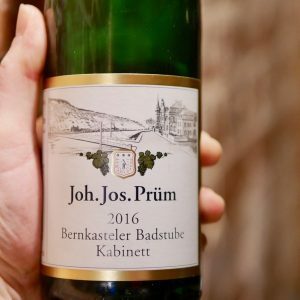 If you have any doubt about just how good these wines are, read this extract, from the article ’10 Things every wine lover should know about JJ Prüm’ by Stuart Piggot. Its Riesling Trockenbeerenauslese (TBA) takes sixth place in the most-expensive list, with an average price of $5647. At #32 is the estate’s Riesling Beerenauslese (BA), and the Riesling Eiswein is at #43. All of these wines are from the famous Wehlener Sonnenuhr vineyard site. 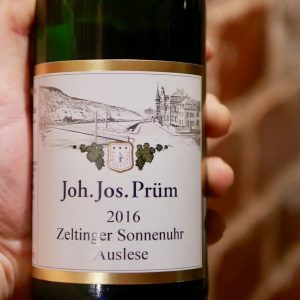 Recent auction results at Zachy’s give an idea of J.J. Prüm’s desirability. In September, 12 bottles of 1983 Wehlener Sonnenuhr Riesling Auslese “Gold Cap” sold for $2450, and at the La Paulée auction in March two lots of 3 bottles of 1959 Wehlener Sonnenuhr Riesling TBA each went for $15,925. What makes this achievement all the more remarkable is the fact that as a category, sweet whites still struggle to gain the popular recognition which experts accord them, and all the “J.J.” wines stand out for their finesse and delicacy rather than their power. The film below explores aspects of Prüm with the 2013 Vintage as context. Although not the year we are offering there are some worthwhile insights shared. So what is the secret is to the quality of the J.J. Prüm wines? How is it that they differ so much in style and quality from the wines of most other Mosel producers? The answer, as always, lies mostly in the vineyards, backed up by winemaking of the highest order. Great sites, old vines, the lowest yields, very late harvesting and selection of only the best berries. In the winery, the winemaking is as natural as possible with as little intervention as possible. The wines typically need several years to start showing their best and can live and develop for decades. 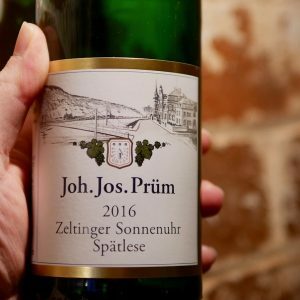 Generally speaking, the later the harvest, the longer the wine can live, so Spatlese is more age-worthy than Kabinett, Auslese more so than Spatlese, and so on. 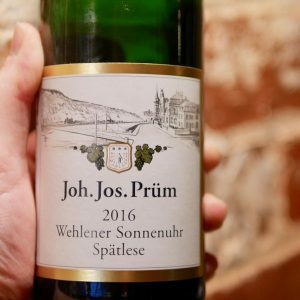 All of the vineyards of J.J. Prüm are renowned yet it is the great Wehlener Sonnenuhr vineyard that is the most famous. This site lies opposite the village of Wehlen on a very steep, south-west facing slope between the Graach and Zeltingen vineyards. Stuart Pigott notes; “For wine lovers around the world, the Wehlener Sonnenuhr name is synonymous with great Riesling. In top vintages, the site yields the richest, silkiest, most seductive wines on the Mosel. 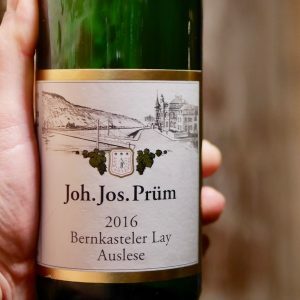 The fame of these Rieslings is inextricably linked with that of the Joh Jos Prüm estate.” Having said this, Prüm also produces outstanding wine from benchmark sites in Graach (Graacher Himmelreich), Zeltingen (Zeltinger Sonnenuhr) and Bernkastel (Bernkasteler Badstube) and it is very difficult to pick these wines apart in blind tastings – they are all exceptional. Yet they all subtly express the unique personality of the vineyard in a given year. 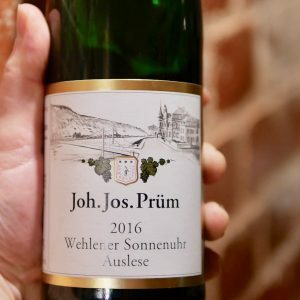 Although the J.J. Prum vineyards all border each other along the same riverbank and share roughly the same soils (Devonian slate), each site has subtle, yet important differences that result in quite distinctive styles of wine. We explore these in more detail in the wine reviews below. The vineyards we are looking at in this offer are those of Wehlener Sonnenuhr – The Sundial of Wehlen, Graacher Himmelreich – The Kingdom of Heaven, and, Bernkasteler Badstube. You can see just how incredibly steep the vineyards of the Mosel can be and how dominant the slate rock is, often driving the root systems meters into the hillside. The best vineyards of Germany’s Mosel Valley are incredibly steep, south-facing slopes with mineral-rich slate soil and a favourable position near the river. Excellent drainage and the heat-retaining quality of the rocky slate soil also help to produce fully ripe, concentrated wines. The combination of these elements results in racy, mineral-inflected Rieslings that are fruity, crisp and very refreshing to drink. Bernkasteler Badstube is the last of the vineyard sites that can appear on a J.J. Prum label. This vineyard borders those of the Graacher Himmelreich on the latter’s southern edge. The Bernkasteler Badstube slopes are on a marginally shallower gradient, with deeper soils than the Graacher and Wehlener, while the western orientation allows the vines longer exposure to the afternoon sun. The Badstube typically produces a wonderfully floral, delicate and mineral wine. 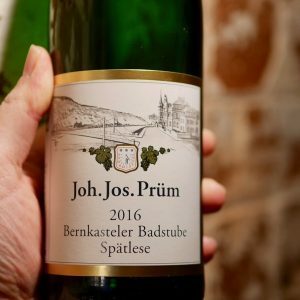 Overall, the wines are usually slightly more delicate in structure and weight when compared with the wines of Graacher or Wehlener but they are wonderfully racy and fine examples of the middle Mosel. Graacher Himmelreich directly borders the southern edge of the Wehlener Sonnenuhr vineyard. The wines from this site often often challenge those from its more famous neighbor, especially in hot, dry years. Graacher wines attract with their racy acidity, a pronounced minerality (that reminds of crushed rock) and slightly different fruit aromas and flavours (more in the citrus spectrum). Often, the wines become accessible slightly earlier than the Wehlener Sonnenuhr and are deliciously mouth-watering when young. Looking at the vineyard conditions, the hill faces slightly more westwards than the Wehlener Sonnenuhr , i.e. it has a more south-west exposure, it is a little less steep and has deeper soils which act as excellent water reservoirs. While the final overall annual statistic would be suggestive of a very average year in terms of temperatures, sunshine hours and rain, 2016 was anything but this: An extreme first half year with remarkable temperature variations and well-above average rain challenged the vines a lot, before they had to adopt to very calm, extremely dry weather conditions in the second half. Despite an unusually sunny August and September, the grapes ripened at leisurely pace, prompting us to start harvest only very slowly on 10th October. Very calm weather conditions in the following weeks allowed us to continue very unhurriedly, and finish only in mid November. The long harvest brought us a well-balanced range of Kabinette, Spätlesen and Auslesen, and in the final phase a limited quantity of partially botrytis-affected Goldcapsule grapes. Though this was not a high botrytized vintage, we could also select a small portion of noble rot grapes at Beerenauslese level in November. Early tastings revealed wines of high balance and finesse, with a very pronounced minerality, expressing the vineyard characteristics particularly well. Katarina Prüm. Prüm’s winemaking often results in a burnt match aroma in young wines and wines just opened. As the wines age the character tends to dissipate. 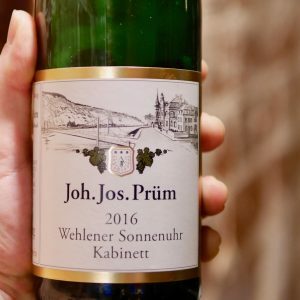 If you’re drinking a young Prüm it’s worth making sure you have time to allow it to breath in glass or to decant on opening if necessary. The 2016’s have less of this character than previous vintagious. We have a selection of 2009, 2012 and 2015’s available is you’re feeling thristy! View them here. *Please Note: This offer is subject to allocations. Stocks will be limited. First in best dressed. You will only be billed once your allocation is 100% confirmed. Plenty of ripe apple and apple-blossom aromas, making this sleek and crisp Kabinett very attractive. The hint of blackcurrants might remind some drinkers of sauvignon blanc, but the wine is so much more elegant than the lighter wines of that grape. Drink or hold. Very youthful, but brimming with white fruits and minerals. This is easy to enjoy right now. However, in the background of this sleek beauty, there's a note of wet stones that grows through the long and cool finish. Drink or hold. Still a little funky from the wild ferment, but there are also beautiful notes of floras and ripe white peaches. Very elegant and polished with a super vibrant finish that makes you reach out for the glass again. Drink or hold. A very bright white-fruit character. Sleek and very crisp with stunning freshness at the long, straight finish. Drink or hold. There are delicate spices and very attractive succulence to this Spätlese. The acidity is very much in the background until the finish lifts off. Drink or hold. Juicy but super elegant and refined with great mineral freshness, making this an extremely attractive wine. And yes, this has some sweetness but you'd hardly think so. Where are those spicy prawns? Drink or hold. Welcome to the heart of the Mosel! A great floral beauty with an extremely precise balance of delicate fruit sweetness and filigree acidity. Drink or hold. Juicy, polished and gull of blossoms. It shows a very attractive balance of ripeness and acidity, making it hard to resist right now. But there's plenty of aging potential here. A rich and delicate Auslese with plenty of depth, but a light touch at the long graceful finish. Drink or hold. This is a wine that has a couple of decades ahead of it. Stunning succulence and subtlety. The concentration and power are completely underplayed until you get to the brain-rattling finish of this Mosel masterpiece. Drink or hold. About Prüms Goldkapsel wines: Think of them as limited edition, rather small production lots of the best Auslese of a vintage. They are made from stronger selected grapes containing higher concentrated juice, usually affected by a certain amount of botrytis / noble rot, capable of aging even remarkably longer than “basic” Auslesen, lasting for many decades. In the course of time, they lose some of their sweetness, gain more and more elegance and harmony and the complex profile and depth come to the forefront. The labels are exactly the same, just the capsule and of course the price are different! A stunning Auslese with a delicate floral-honey character and a slew of yellow fruits. This is very seductive. The finish is very long and creamy. Drink or hold. This is just beginning to give its best, but it will be even more exciting from 2019! Enormous energy and more than enough richness. The finish turbocharged, so hang onto your hat! Drink or hold.te and so sweet! Lychee. Super elegant and filigree with a delicacy that you don't find in many other high-end white wines regardless of grape variety and region of origin. A very long and clean finish. Drink or hold. An insanely delicious dessert wine. Picked and pressed while the grapes are frozen, this vibrant, racy dessert wine conjures flavors of densely packed pear, apple and guava, with an intense, nervy edge in the aroma. It is luscious, silky and juicy on the palate, with bright acidity giving it a crisp, dynamic finish.